Fishing Cat (Prionailurus viverrinus)or Baghrol, Gobagha, Mach bagha in Bengali is a medium sized wildcat (5 to 15 kg) that is found in the Indian subcontinent and parts of south-east Asia. 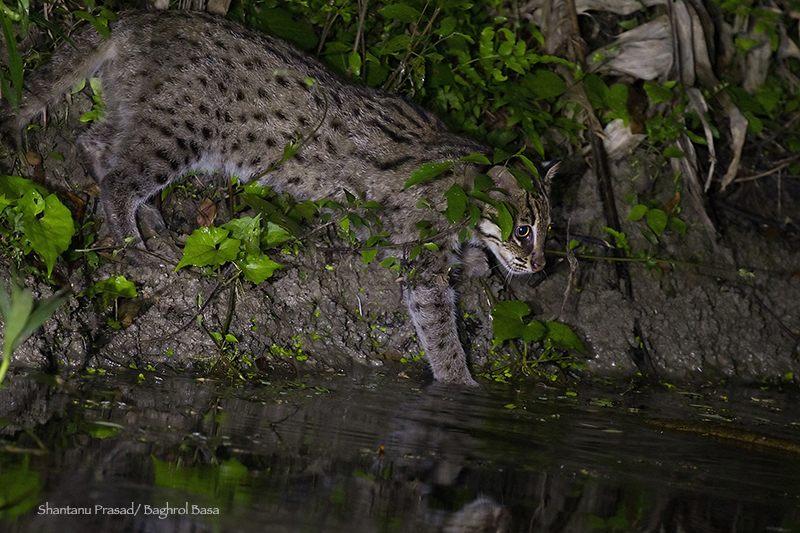 This wildcat evolved as a wetland specialist species and has some unique characteristics that allow it to survive in wet, watery conditions. For example, as its name suggests the fishing cat catches fish that is available in abundance in wetland areas but it also preys on other prey species like snakes, crabs, birds, mammals and others. 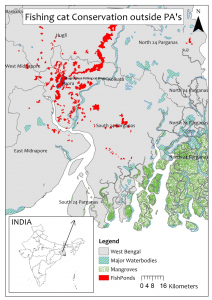 West Bengal state with is rivers, floodplains and mangroves is a stronghold for the fishing cat and an important area for the fishing cat in the world and for that reason it has been declared as the state animal of West Bengal. The fishing cat is a greyish coloured cat covered with black spots. Black lines run from the top of its forehead and run to the back of its neck and break into dotted lines on the back of its body. The tail is short and is dotted with spots that look like rings from a distance. It has small ears and the back of the ears are totally black with a white spot. The cat has very coarse hair, unlike our domestic cats whose hair feels soft to the touch. The thicker bristles most likely can shake water off faster and keep the cat dry. The male fishing cat has a larger body size than the female cat. The cat has short legs and looks thick like a barrel. It toes are connected with small webbing that allows it to swim well and also grip slippery fish. Interestingly fishing cats are also found in human-dominated landscapes and live in close proximity to villages. Sometimes, living close to human settlements can have negativeconsequencesfor both people and the cats. Addressing and keeping in checkthese negativehuman influences is the core focus of our research and conservation work. 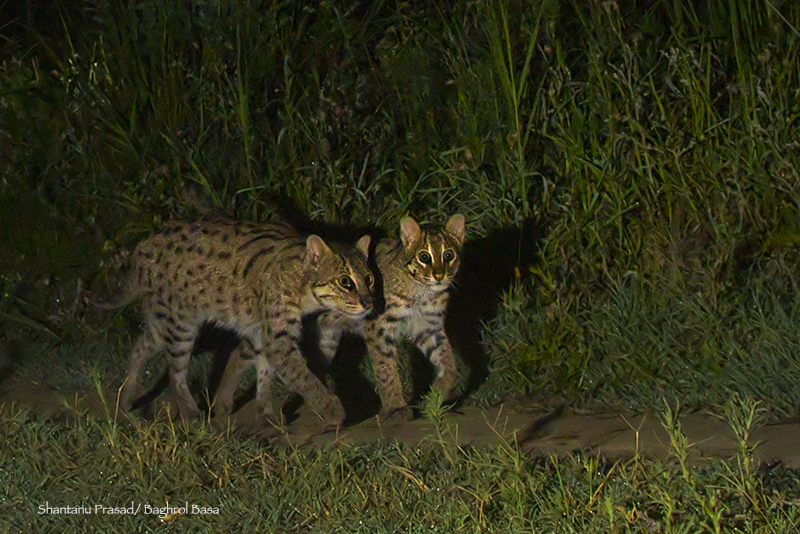 As part of our fishing cat conservation work at Baghrol Basa, we actively look for fishing cats in our areas. We frequently stumble upon the cats near fish ponds and observe them for long periods (refer MAP showing extent of fish ponds in the area). We document facets of their behaviours, which are analysed and interpreted. The information is then used to formulate strategies for conservation. 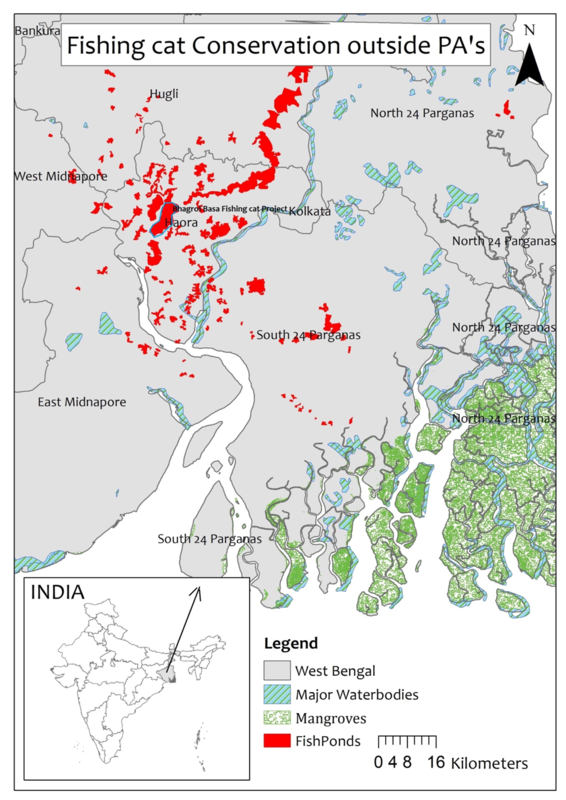 Areas in red are fishponds in the Howrah District and its vicinity. Fishing cats feed in and around these fishponds. Baghrol Basa Homestay and the ongoing Fishing cat Project are located in the area marked with a blue circle. 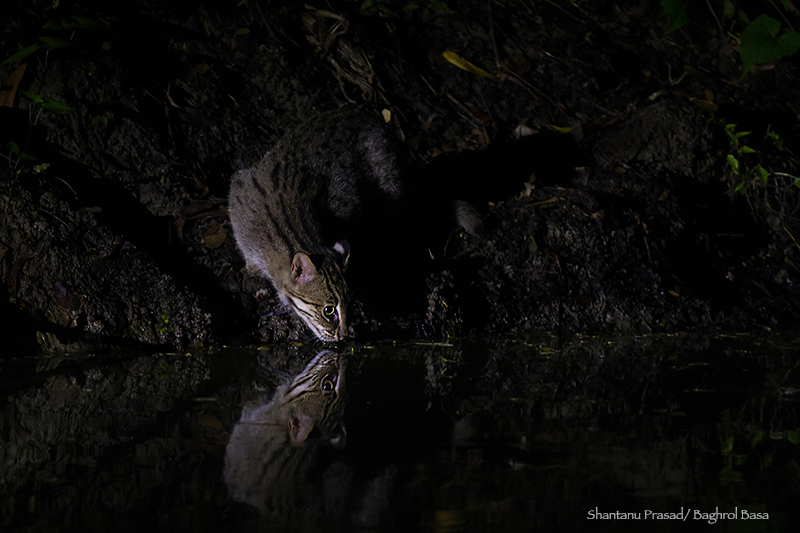 Our observations reveal that fishing cats are very comfortable in the water. It is true that many cats dont like getting water, right? Well, we observed fishing cats enter the water and stay in the water as they stalk fish. They also dive into the water to catch fish and other prey animals. They are completely at home in the wetlands. 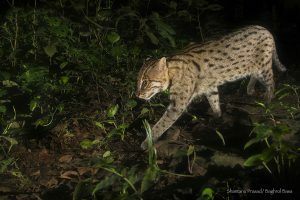 Fishing cats in our area are largely nocturnal in nature. This is most likely because people are active in the area during day time. Their activity pattern may be different in areas where there are no people. 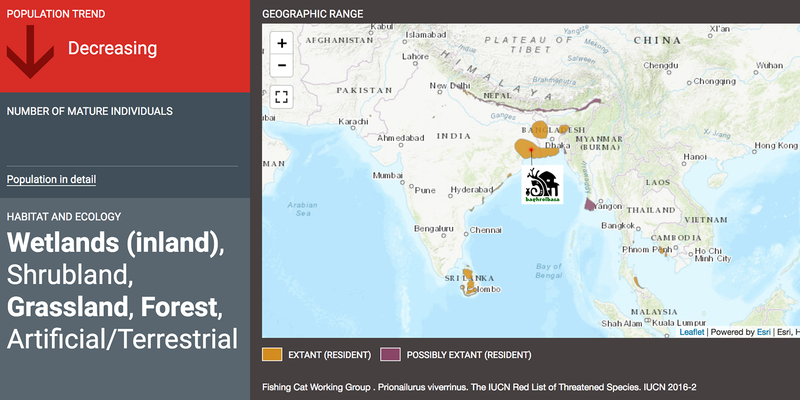 Fishing cats in our area live in close proximity to human settlements. 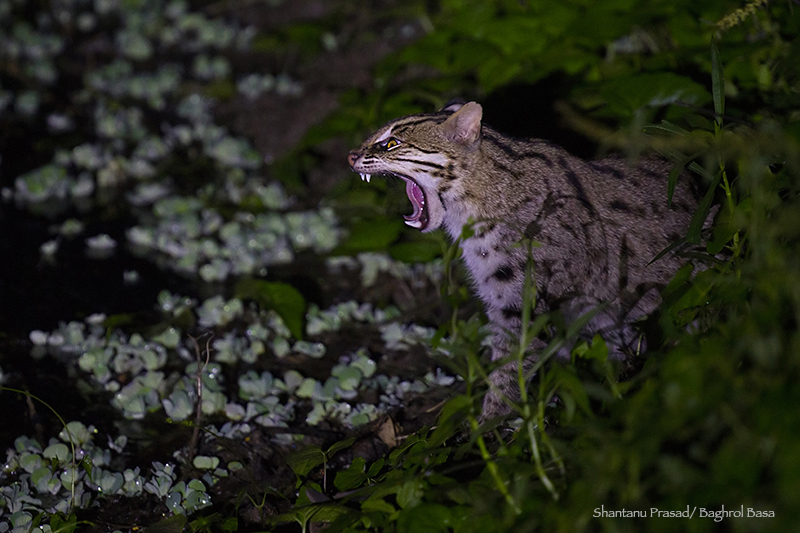 It is not surprising to see a fishing cat resting at night in front of a villagers house. Though bigger than domestic cats, fishing cats are not a threat to people. 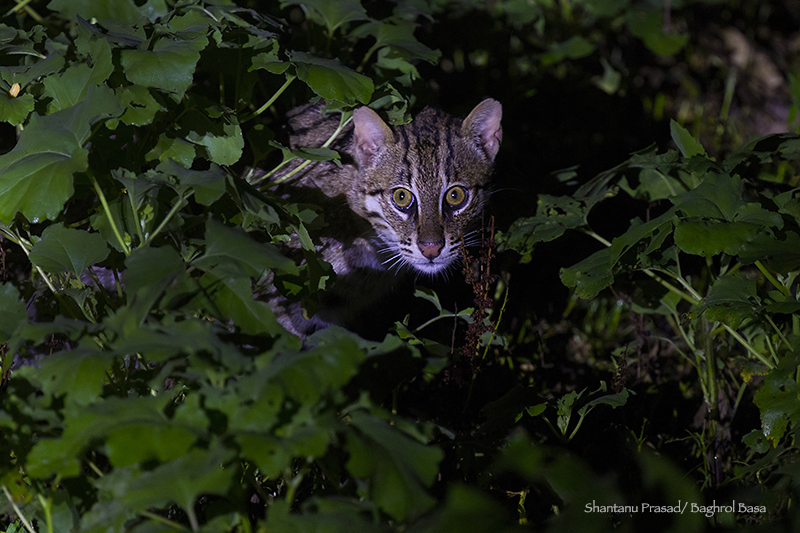 We have evidence of fishing cats interacting with other carnivores like Golden jackals and jungle cats in our area. These species do not bother the fishing cat and let it have its way. We are in the process of understanding the impact of village dogs on the fishing cat. Fishing cats in our area eat different sorts of fish. They also eat rodents, snakes, monitor lizards, birds and insects and sometimes domestic animals. We are not sure on the extent to which they opportunistically scavenge. Like many smaller felines, fishing cats communicate with hisses, guttural growls, and even a low, demanding meow. These sounds are audible to the human ear. A male and female make a sound called chittering as part of their courtship, with the female signalling her willingness to breed and the male communicating submissiveness.Chemical communication:Fishing cats mark their territory with urine and faecal droppings that has a distinctively strong smell.